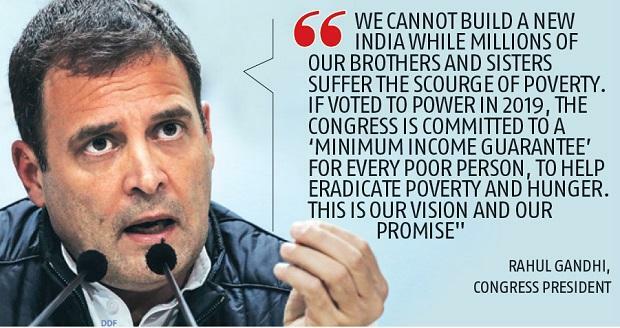 Somewhat reminiscent of his grandmother Indira Gandhi’s poll promise of garibi hatao (remove poverty) for the 1971 Lok Sabha elections, Congress President Rahul Gandhi on Monday said, if voted to power, his party would implement a minimum income guarantee (MIG) for the poor. He made the promise while addressing a public meeting in Chhattisgarh’s Raipur. Party sources said a MIP for the poor, and not universal basic income (UBI), would be their key manifesto promise for the upcoming polls. Details, they said, would be made public in the weeks to come. Former finance minister P Chidambaram, chairperson of the Congress' manifesto drafting committee, also said the party would explain its plan in the manifesto. Party sources admitted the announcement was an attempt to steal the thunder from the Narendra Modi-led government’s interim Budget. There is speculation that stand-in Finance Minister Piyush Goyal could promise a minimum monthly income for farmers in his Budget speech on February 1. Congress sources said the manifesto would answer some of the questions, including whether MIG be a statutory right, how much would be ‘minimum’, the mechanism to select beneficiaries and the budget, including from where the government would raise additional resources, and whether existing benefits would be get subsumed in MIG. The Congress is looking at MIG as ‘means’ based, possibly fixing minimum wages as the threshold, and compensating households with whatever shortfall they face in reaching that threshold. The Congress says its policies, particularly the rural employment guarantee scheme and food security law, lifted 140 million people out of poverty in its 10-years of rule. Last week in Bhubaneswar, Gandhi had said MGNREGA was a paradigm shift that served as a labour market correction by raising minimum wages across India. Similarly, the MIG, the party think-tanks believe, would be the next generation of social policy to ensure that every household below poverty line, whether urban or rural, is guaranteed a minimum level of income to raise their living standards and eradicate starvation and destitution. The eligibility of threshold will be determined by SECC (socio-economic caste census) data and other methods to identify the poorest of the poor. It believes “the rising incomes in the hands of the poorest would lead to a revival of consumption led growth in the Indian economy, as previously witnessed in the UPA years”. “If voted to power in 2019, the Congress is committed to a ‘minimum income guarantee’ for every poor person, to help eradicate poverty and hunger. This is our vision and our promise,” his tweet said. In its 2004 manifesto, the Congress had promised farm loan waiver, which it implemented in 2008. Since the run-up to the UP and Punjab Assembly polls in 2017, Gandhi has promised farm loan waivers in all Assembly polls. The promise was met after the party come to power in Rajasthan, Madhya Pradesh and Chhattisgarh recently. “The principle of UBI has been discussed extensively in the past two years. The time has come to adapt the principle to our situation and our needs and implement the same for the poor. We will explain our plan in the Congress manifesto,” Chidambaram tweeted. The former finance minister said that during the Congress-led UPA rule at the Centre from 2004 to 2014, 140 million people were lifted out of poverty. “Now we should make a determined effort to wipe out poverty in India. The poor have the first charge on the resources of the country. Congress will find the resources to implement the promise of Rahul Gandhi,” Chidambaram’s tweet said. 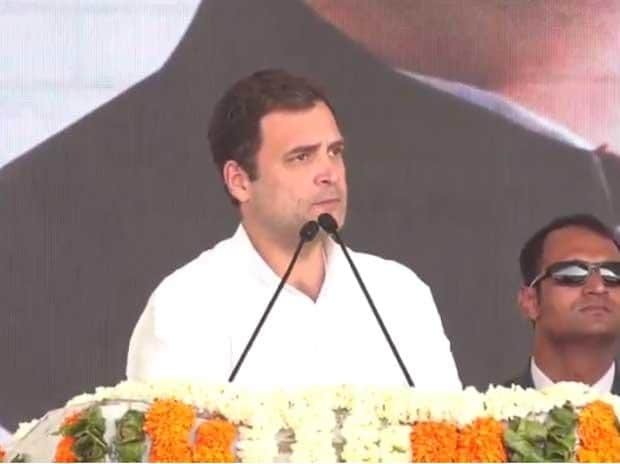 In his speech in Raipur, Gandhi went on to accuse the BJP of trying to create two Indias — one of the Rafale scam, Anil Ambani, Nirav Modi, Vijay Mallya, Mehul Choksi and the other of the poor farmers. He distributed loan waiver certificates to some of the beneficiary farmers during the 'Kisaan Abhaar Sammelan' in Raipur to express gratitude to Chhattisgarh's people, particularly farmers, for voting them to power after 15 years.